I’m a terrible birder. I used to be pretty good, but I’ve kind of lost my motivation – there are too many other things to look at when I’m out in the field. I, on the other hand, spent most of the time wandering through the sandhills looking down at the ground for signs of life in the prairie. (It’s hard to see many birds while looking down…) My biggest contribution to the birding portion of the trip was that I pointed out a couple owl pellets (on the ground, of course) to the group. Apart from that, I was pretty useless. Well, useless from a birding standpoint. 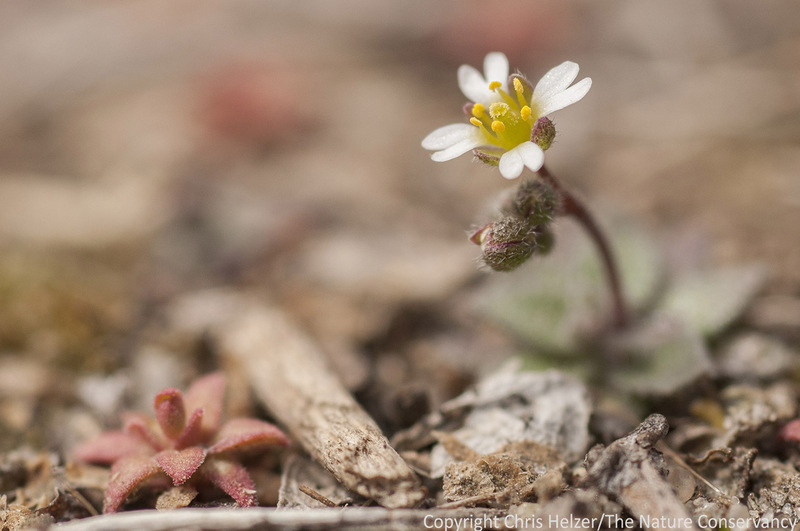 From a botanical standpoint, I actually found three different wildflower species blooming! That was a surprise, given how cold it’s been this spring, and how little green there is across the landscape. All three wildflowers were very short little annuals, and were near parking lots at the reservoir where they were exposed to full sun but sheltered from cool winds by nearby trees. The third wildflower of the day. …Ok, I wasn’t completely unaware of the birds around me… I actually did stop to take this photo of some pelicans late Friday morning, before heading over to the ranch to meet up with everyone else. White pelicans at Calamus Reservoir. 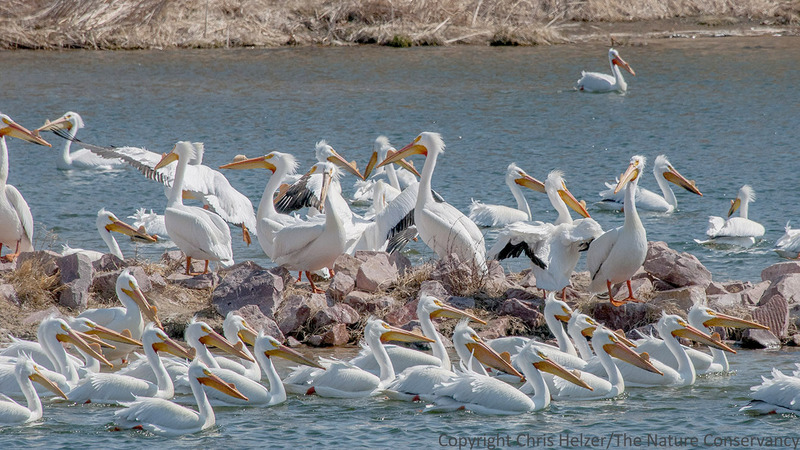 This entry was posted in Prairie Animals, Prairie Photography, Prairie Plants and tagged annual, calamus reservoir, early flowers, grassland, nebraska, pelican, prairie, spring wildflowers, white pelican, wildflower by Chris Helzer. Bookmark the permalink. The last white one has an nondescript common name that I know it by, prairie fame flower… it’s been many years since I last saw it! Am I wrong? The top flower is almost certainly a Pink – Caryophyllaceae – (a few have only 4 petals) but it isn’t one I know. May be a more western species than we get in Illinois. 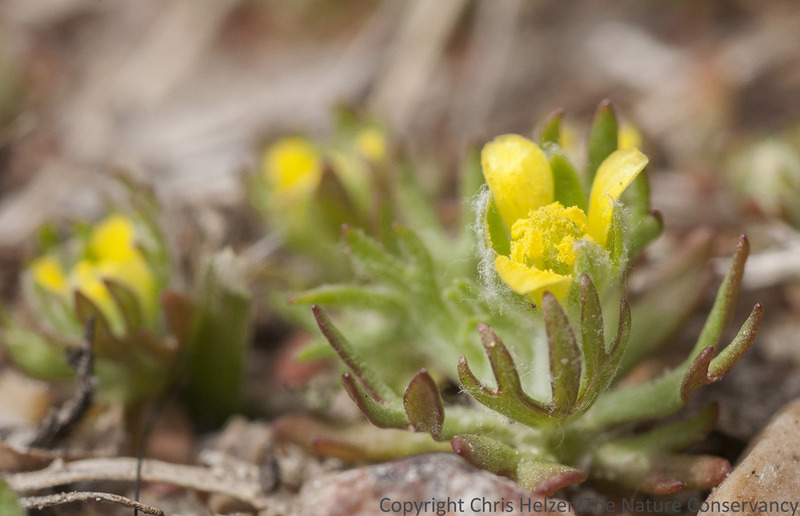 Top one looks like Draba verna to me. Not the 4 petals, 6 stamen configuration – typical of the Brassicaceae. Check out Leopold’s essay on this species in Sand County Almanac. 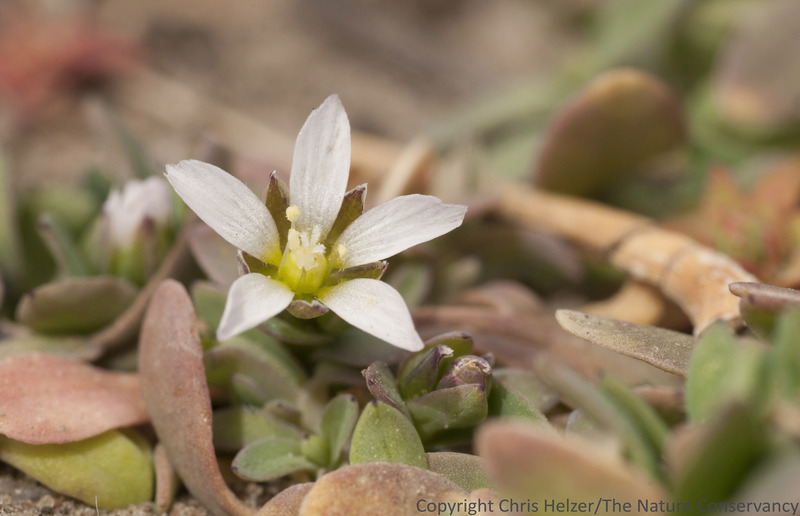 I hate to argue with Stuart, but that first one is a mustard – four (though deeply cleft) petals and six stamens — probably a little Draba, possibly D. verna. Don’t know the yellow one, but it doesn’t look like the plant that usually goes by the name winter aconite http://tinyurl.com/Eranthis-hyemalis. Now that third one does look like it’s in Caryophyllaceae to me, maybe Arenaria, possibly A. serpyllifolia. Nice pelicans, by the way! In our country (Washington), the yellow one looks like Ranunculus testiculatus. PLANTS database shows it growing in your neck of the woods as well. Peter is right. The yellow flower is Ranunculus testiculatus. It occurs east of the Rockies, though it is very common in the Interior West. “He who hopes for spring with upturned eye never sees so small a thing as Draba. He who despairs of spring with downcast eye steps on it, unknowingly. He who searches for spring with his knees in the mud finds it, in abundance.”–Also Leopold, A Sand County Almanac…though more likely in reference to D. reptans than the D. verna you’ve got above. More likely D. reptans because so hairy? Oops, shoulda read more carefully. So you agree with D. verna! It looked a little shorter and fuzzier than I’m used to seeing down here, about an 8 hour drive to the southeast of Chris, so I wasn’t certain. No pasque flowers out that way, Chris? They’re in full bloom in the Loess Hills right now. Need to see that preserve sometime! Thankfully birds sing and blurt out all sorts of sounds, so you COULD bird by ear AND still look down at the really cool plants. Very true, Jeanine. Though harder with ducks sitting on a lake. They didn’t seem to be making much noise. I do notice other birds trying to break my concentration now and then as I try to look at bugs and flowers, though.